Upgraded Aakash tablet set to be launched in May amidst controversies between DataWind. Aakash tablet project has been transferred from IIT-Rajasthan to IIT-Bombay (both renowned technical institutes in India) due to a feud that broke out between IIT-Rajasthan and DataWind, the company that manufactures Aakash tablets for the Indian government. IIT-Bombay has sent a purchase order for 100,000 updated Aakash tablets to the DataWind. A certification test will be conducted by IIT-Bombay and C-DAC (Centre for Development of Advanced Computing) after the deliveries has been made in May. Earlier, DataWind accused IIT-Rajasthan from keeping them out of the tender that was released by them. It also rejected the units that were delivered to them. According to DataWind the rejections were made due to some unscientific criteria and being biased to them. It was also known that IIT-Rajasthan has not cleared the previous payment dues to DataWind‘s UK headquarters for 8000 units, of which 600 were accepted. IIT-Rajasthan also declared the Letter of Contract to DataWind, commercially invalid. DataWind CEO, Suneet Singh Tuli said that IIT-Rajasthan has paid for all the tablets to Quad; a subcontract manufacturer of DataWind apart from the 600 which were retained by IIT-Rajasthan. Quad was also accused of selling the tablets that they were paid off in the open market. Two professors from IIT-Rajasthan were slapped legal notices by DataWind while IIT-Rajasthan has asked for 10 percent non-delivery liquidated charges from DataWind. A new version of tablet UbiSlate, was launched by DataWind for the public. Though the deliveries have not been started yet, but bookings were in full flow in the month of January. It was revealed that they received 8000 pre-bookings every day. DataWind CEO, Suneet Singh Tuli has said that they would start the deliveries at any moment and try to catch up in next two weeks. 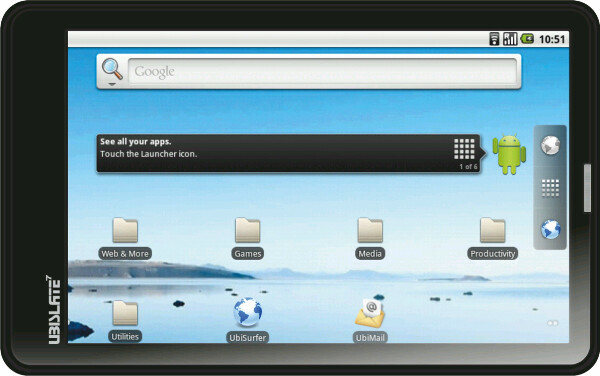 DataWind is set to launch its latest version of commercial tablet, UbiSlate on coming 26th of April.